The Davis family opened their first boarding facility in 1986 and has been a constant in the animal care and training industry since. Upon moving to Las Vegas the family realized that what this city had to offer in overnight dog care and training was by far not up to their standards. Realizing that the average animal lover does not want their fur baby kept in a cage, or behind cage like bars, the Davis’ set out to create a one of kind cage~free, no bars, complete canine facility. Imagine the relief of your dog when they are left in an environment that looks and feels more like home. This was the vision of the Davis family and the start of Club K9. You will immediately see the difference as soon as you arrive at the 18,000 square foot center! The vast years of experience the Davis family has in animal behavior, care and training is apparent with every detail of Club K9. Please stop by the facility and see for yourself the best Las Vegas has to offer dog lovers. 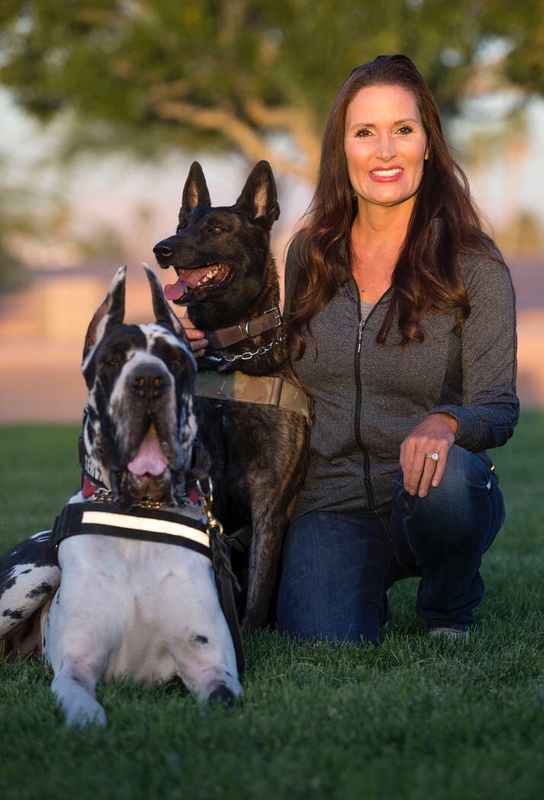 Susan Davis owner of Club K9 with Service Dogs Goomba and Luna.